Find out exactly why and how Bodybuilding.com launched its latest sports nutrition line. Plus, see what new products are in store for 2018. This year, nearly two decades after it was founded, Bodybuilding.com has launched its own full-scale sports nutrition line, complete with 14 products. The new line includes Signature 100% Whey Protein, Pre-Workout, Amino Plus Energy, BCAA, Green Tea Extract, Fish Oil, Creatine Monohydrate, L-Carnitine, Multivitamin, Testosterone Booster, Micronized Glutamine, Glucosamine and Chondroitin, ZMA, and Vitamin D3. 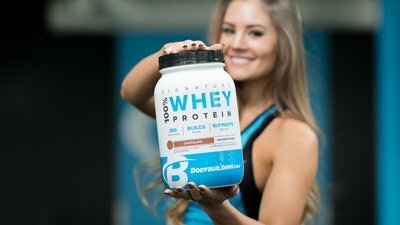 I caught up with Bodybuilding.com's manager of innovation and product development, Rachel Kreider, RD, and asked her to provide a glimpse into the process of creating new Bodybuilding.com nutritional products. Kreider is part of the team that developed the formulations and the tastes of the new Signature products. She then worked with manufacturers to bring these new products to life—and to the Bodybuilding.com store! Bodybuilding.com has been around since 1999. Why launch the Signature line now? Bodybuilding.com has offered its own private-label products in the past, but didn't give them a big marketing push. We decided the time had come to take everything we've learned over the past two decades and create specifically formulated products of our own. Our goal is to offer effective formulations with the best taste at a cost that enables our customers to build supplementation into their ongoing training and nutrition regimens. What are the key differences between Signature and Bodybuilding.com's earlier Foundation or Platinum lines? Some products will be the same. For instance, we continue to receive very high marks for our green tea extract and will continue to use the original formula for our Signature Green Tea product. Other products will undergo slight formula modifications, and we're going to start offering new products with ingredients we've never used before. We're also making it easier for customers to locate, learn about, and purchase our in-house supplements. Did you set out with a specific approach to formulating these products? Our goal was to start with research-backed ingredients and provide customers with 100-percent transparency. Ultimately, our focus was on using trusted ingredients to help our customers build a solid sports nutrition foundation. For our protein, we began with a general target for caloric and macronutrient content, and adjusted protein levels to make sure we met customer per-serving expectations. We also adjusted the carbohydrates and fats in our chocolate-flavored whey to keep its carb and fat levels on par with the vanilla-flavored whey. Based on clinical studies, we have added a digestive enzyme blend called ProHydrolase to our Signature protein products. The enzymes help the body break down whey protein to improve absorption and bioavailability. We also paid attention to taste and drinkability, creating products that are not overly sweet and that mix well. We included as much whey protein isolate and whey protein hydrolysate as possible. Since whey protein hydrolysate can be bitter, we had to adjust the formula to balance flavor with nutrient levels. It was worth it, though; amino acids from hydrolyzed proteins are absorbed more readily than those from fully intact proteins. How is your protein different from others on the market? Signature Whey Protein contains a blend of whey isolate, concentrate, and hydrolysate. Whey hydrolysate is more easily absorbed because it is broken down into peptides, which is the form of amino acids most human bodies prefer. To ensure complete digestion, we include 6 grams of whey protein hydrolysate in our chocolate-flavored whey protein and 7.5 grams in our vanilla-flavored protein. Where do you see the Signature line going in the future? Our goal at Bodybuilding.com is to make products that are accessible and understandable. Rather than trying to be the first company to put untried products or doses on the market, we want to be known as the company that uses customer research and scientific research to formulate safe and effective supplements—a company our customers can trust. We want Bodybuilding.com Signature to be a foundational line of products that offer our customers tried-and-true ingredients at a good price. From there, we'll continue to create even more products that reflect cutting-edge thinking on nutrition supplementation—that we can stand behind 100 percent. In the meantime, we want customers to know that we'd love their feedback on our expanding Signature product line. Let us know if you'd like us to add a new product, a new ingredient, or a new flavor! Along with the rest of the product-development team, I personally answer questions sent to Bodybuilding.com via customer service, Facebook, Instagram, and email. Unlike many brands, we're committed to answering every product inquiry we receive, which reflects our true passion behind what we're doing here. We just want to keep providing Bodybuilding.com customers with awesome products they can believe in. Which athletes are affiliated with Signature line? Bodybuilding.com has currently signed Julian Smith, also known as "The Quad Guy," and IFBB Bikini pro Taylor Chamberlain to serve as Signature team athletes. We plan on expanding our roster as we go along. How did you decide which products to include in the Signature line? Our product selection is based on years of customer data. We consistently see a high demand for pre-workouts, protein, creatine, and glutamine, and increasing demand for testosterone boosters. We've also seen an increasing amount of interest in Vitamin D, so we wanted to be able to provide it to our customers at a great price and usually with free shipping. Do Signature products contain proprietary blends? No, they don't. In fact, we have worked hard on our packaging to make it very clear that we do our own formulations instead of relying on proprietary blends. We designed our labelling so customers can understand exactly how much of each ingredient we have used to make our Signature products. What was the overarching approach to flavoring Signature products? The best way to come up with truly outstanding flavors is to work with flavor professionals. That's why our product design team works closely with a flavor company to help us achieve our flavor preferences. Along with chocolate and mocha cappuccino flavors, we knew we wanted to create an outstanding vanilla taste. The flavor company introduced us to a long list of different vanilla profiles, including melted ice cream, cake batter, or bourbon. Once our Bodybuilding.com product team chose the flavors we liked most, we brought samples back to our Boise headquarters and invited employees to try them at a companywide event. The flavors our team chose turned out to be immediate hits and went on to be used in our final product formulations. Which unique ingredients or combinations are you most excited about? We are currently on Round 5 of flavor testing for a new weight gainer and a pure whey protein isolate. We're also looking at a standalone citrulline product to which customers can add their own specific doses of creatine, pre-workout, and other supplements. Our team also meets regularly with ingredient providers to find "the next new thing," and we are committed to creating products that reflect the best of the industry's latest thinking. At what rate do you plan to add new products to the Signature line? Our goal is to add new products or new product flavors to the Signature line every three months. In general, it takes about 6 months to go from product idea to a product being ready to ship. We began working on our pure isolate, casein, and gainer products at the end of 2017 and hope to have them available by June 2018. What kind of people will benefit most from the new Signature products? We've formulated our supplements so that they can be used by a general cross section of people. We also paid attention to creating a price structure that's within our customers' budgets. Our goal is for the Signature line to serve as a foundation for overall sports nutrition: basic supplements that will help each customer reach their unique bodybuilding and fitness goals. Mark Barroso is an NSCA-CPT, Spartan SGX Coach/Obstacle Specialist, and freelance fitness writer based in New Jersey.